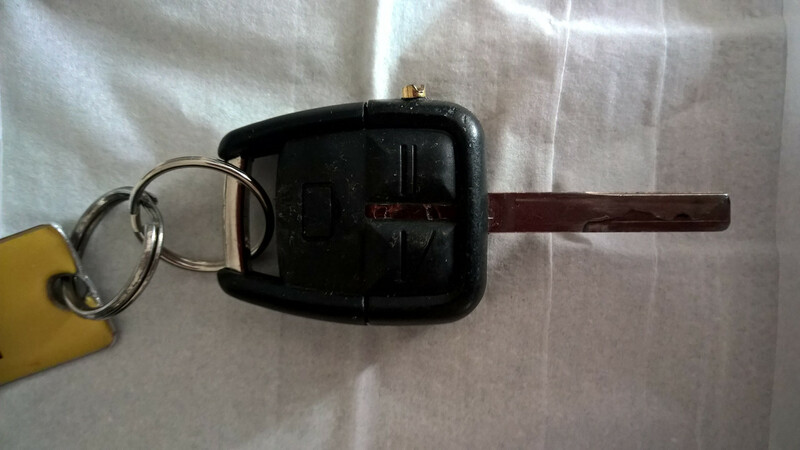 Not for the first time with my past Omega's, and now with my existing one, both key fobs have given up the ghost with the integral clip that is meant to stop the yoke separating from the main battery compartment, usually when you are pulling the key out of the ignition. So I came up with a simple fix. 1mm hole drilled carefully into one of the sides of the yoke (the side without the chip), and a shallow (not penetrating) corresponding hole in the side of the battery compartment, and the two sections put together with an ex-electrical switch cable brass grub screw neatly screwed in to hold both together. Simples! ... usually when you are pulling the key out of the ignition. A couple of blobs from a hot glue gun works. It's very handy for such small items that need to be almost permanently attached. Also, get rid of all of the shrapnel on your keyring. You do not want every key you've ever owned hanging off the ignition key. Split it into usable bunches, even if you keep them in the car. Is this a common problem. Never had an issue on any of mine? If ever I did break a fob, I'd rummage through my spares box, and dig out the tech2, and treat it to a "new" one. I think it may have happened to one of mine once. I might not have a genuine Tech II but can achieve the same , that said, should only be a case of cutting the blade if replacing the horseshoe, PCB and Immobiliser chip will swap over. WHat happens, guessing the little clip on the horshoe snaps off? But that involves cost, with a new blade and then having it cut. My solution cost nothing as I have spare electrical fittings for grub screws in stock. In addition my fobs have had their locking tabs forced too many times by Vx technicians when giving me a battery change at the annual service. Previous ones also suffered from the same treatment, but at my hand!! Happens all the time. I've spent far too much time on my hands and knees looking for customer's immobiliser chips. Every one of them had big bunches of keys, which is also true of worn ignition lock barrels. Good point, actually. I think my keyring is due a cull. ..and it went 'dugga dugga dugga dugga' no more. But everyone knows it's one ring to rule them all, no? Yep, and at last I have found a new way of posting an image thanks to danzigfan in the Test Zone!! Note the brass grub screw on the right. Looks like it's had a very hard life too. Yes, and in reply to both of you I recommend keeping your keys in a handbag / manbag!! I imagine its a tight squeeze in LZ's handbag. She's only got a small one. I mean her handbag, not her other "assets". You haven't seen my handbag TB. My friends joke about how much I keep in it; it is like Mary Poppins bag! I suspect Mrs Mig keeps a kitchen sink in hers. I'm not allowed to look in there for some reason, so I can only surmise.